Baby Mama Drama: Grandpa's 85th Birthday! why you should all love February . Monday night Adam's family was planning a dinner for Grandpa's 85th Birthday..unfortunately, Grandpa wasn't feeling too spiffy. We ended up rescheduling the dinner, but we still paid the birthday boy a little visit so he could blow out his candles and open his presents! He specifically asked Aunt Vickie to make a chocolate cake with chocolate icing. And that's exactly what he got..it was delish! Sorry for the bad quality, this was taken with my iPhone! 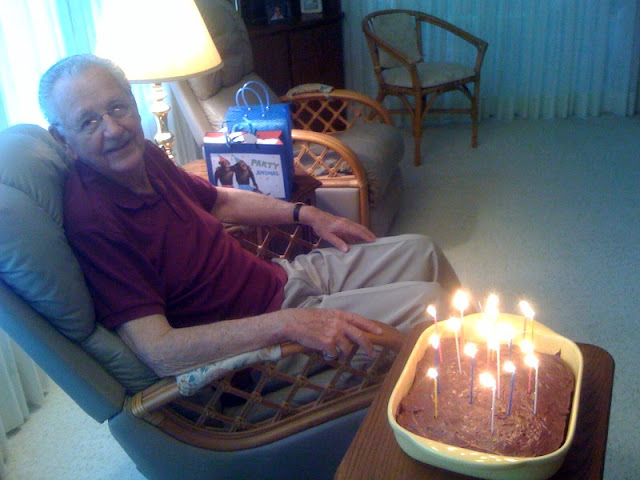 But here is Grandpa with his cake & sparkler candles!